600 denier polyester, 420 honeycomb poly contrast, Front zippered pocket and storage compartment with Zippered side entry. 17”h x 13”w x 6”d. TURTLE - A water symbol representing new life, as it is the first of the animals to stir in the early spring. All animals being part of nature have an important part in the balance of Pueblo life. They are often honored in the form of artwork on pottery, small stone carvings (fetishes) and in ceremonial dances. 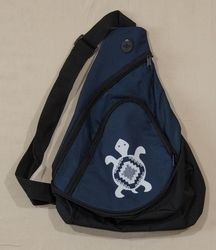 The turtle is one animal that is revered by all Indian tribes of North America, having many interpretations.